This all started with Twitter. A group of runners from all over the UK deciding it would be a good idea to all meet up at a race. But why do things by halves? ... and then 10 months pass and you realise you’re going to be camping in a field in October with a bunch of strangers with a love of lycra and probably no toenails. Luckily Lozza had been one of these strangers 10 months ago and now as one of my running-swimming-cycling partners in crime, we decided we would camp together and if everyone else turned out to be insane or murderous we could hold them off with cleverly crafted weapons made out of tent pegs and camping stoves and hide under the gazebo. Or we could just get back into the Fiesta and drive home again. 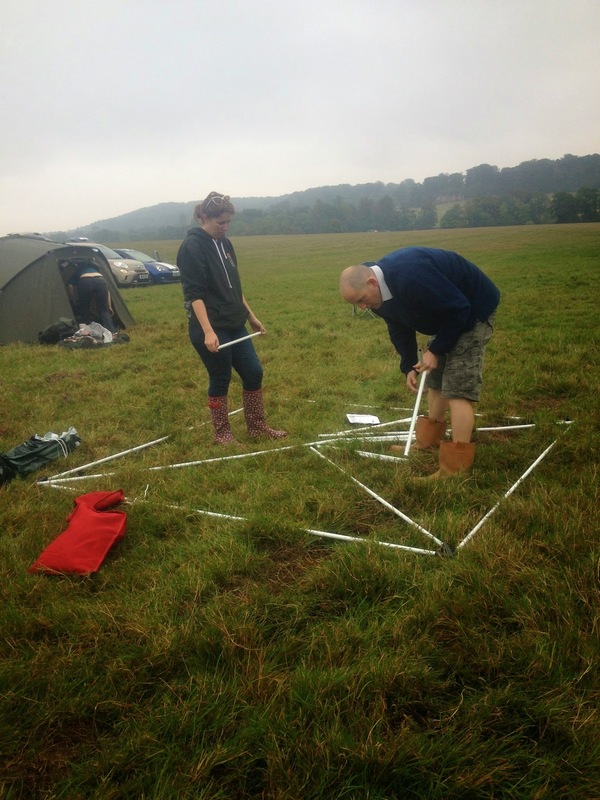 We got to the site of Equinox 24 in the grounds of Belvoir Castle. It was foggy and remote and the portaloos were distant shapes on the horizon. 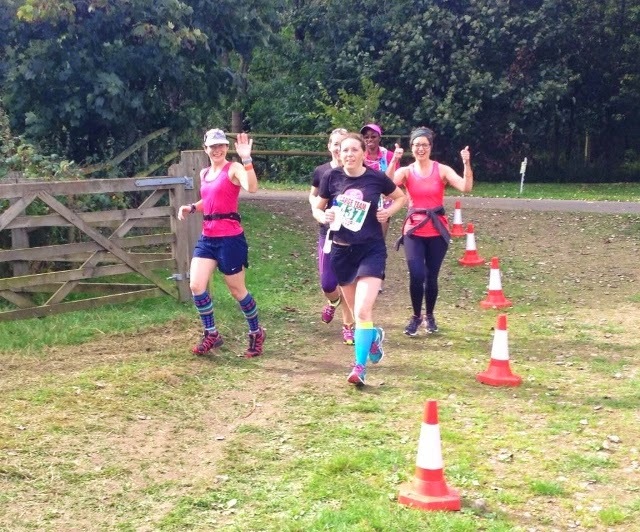 There wasn't a proper loo, Tesco Express or Costa Coffee in sight and we realised that we might be in for a cold weekend running around a field. AND the beer tent hadn't turned up. Wet set up camp at the 9km point with the idea in mind that the runner on the field could bellow on their way past to give a 5 minute warning for the next person in the relay team. And a last warning that if they weren't at the crossover point in the next 6 minutes there would be trouble. We broadcast our location to our Twitter relay running buddies and people started turning up. Despite never having met in real life before, they all seemed strangely familiar. We’d been chatting for almost a year and although accents were unfamiliar, faces were. Albeit not yet in the running kit which usually accompanied their Twitter profile pictures. A penchant for army green camping equipment. A history of breaking cowbells due to overenthusiastic cheering. Ideas of a cleanliness which included picking up sheep poo from our camping area and moving it to outside camp borders. 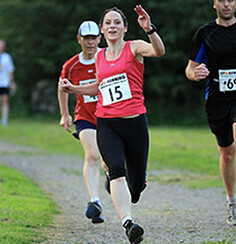 An enthusiasm for running which meant one member was well on the way to 100 marathon club. A severe raisin-farting problem. And a stash of raisins. A hankering after a tuna pineapple pizza. A last place finish in the beer mile. Retina-burningly bright knee length running socks. 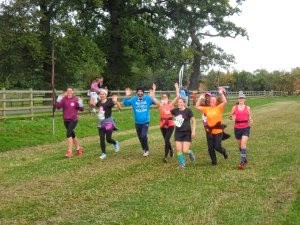 Final lap ... yes I KNOW it looks as though I wore the pink top / grey hat combo for every lap ... I did get changed occasionally ... honest ...! Meeting Alex and Stewart both doing solo runs and both being coherent and cheerful throughout. Sorry Stew for running with you at the dawn lap and ranting about portaloos (I was traumatised). Sorry Alex for missing you on the 5am lap (but at least you missed the portaloo rants). Taking part in the beer mile – but with vodka as the beer tent hadn't turned up – and coming 1st lady … and last …! 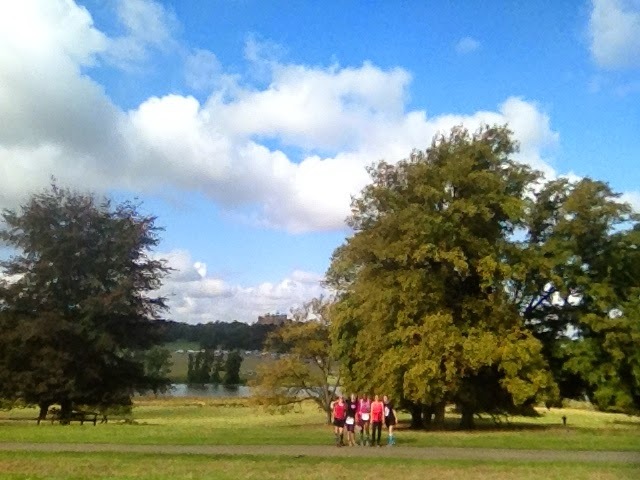 Running additional laps with Helen and with Claire and a final lap with a joint group of the Team Cake and Team Lovely Ladies with plenty of chat, photo stops and laughing. Alexa managing 56 miles as a solo despite never having run further than a half marathon previously. Sparkly - if slightly unreliable – fairy lights around the gazebo. Sid running the entire Equinox 24 in a morphsuit. Lozza being so inspired by the solos that she's entering 2015 as a solo herself! I will be a Solo Servant and on cheering, kit, camp tidy up (minus the sheep-poo-picking-up) and chef duty. Team Lovely Ladies met as strangers on the internet, ran 148.8 miles between us and left as friends. It should be! Was a cracking event! See you there next year!